The Report Builder for Excel allows the rapid construction of reports as forms, columnar reports and master detail reports. 1. Your own application can generate the data for which the report is to be generated. 2. 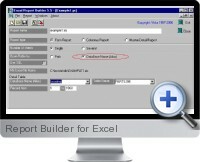 The Report Builder for Excel can make use of SQL through a query editor which is part of the program. This allows the formation of pre-defined reports which are run at a regular interval. Reports can be saved and then viewed and printed as pure Excel documents - there is no need to send any additional executable programs to third parties to whom you wish to send reports. The Report Builder for Excel has the ability to produce mailing labels and multi-column reports using the capacities of Excel. The page size can be automatically scaled down in order to print several report pages on each sheet of printer paper. The use of different fonts, sizes, styles and colors is fully supported, just as it is under Excel. It is possible to call the Report Builder for Excel from other programs. The qualities of the Report Builder for Excel make it a tool to be considered seriously by any organization with a need to effectively and efficiently disseminate information both between their own staff and to clients, suppliers etc.